Is This Finally FC United’s Year? Upwardly mobile FC United of Manchester United have never had a better opportunity to seal that much needed promotion to Step Two, a promotion which would be good for non league in general. For the past four seasons, the Red Rebels have suffered heartbreak in the Northern Premier League playoffs, narrowly missing out on a place in Conference North. This season, however, they find themselves in a fantastic position. Nine league wins in a row, coupled with a recent collapse from one-time runaway leaders Skelmersdale United, has seen Karl Marginson’s men reduce Skem’s lead to just three points, and they have seven games in hand to boot. As you can see, there are an awful lot of clubs who could theoretically overtake Skelmersdale, who have played more games than anybody in the division. In the top ten, the only side now who you would probably say have no realistic chance of winning the title are Grantham Town, by virtue of the fact that they have just one game in hand on the leaders. 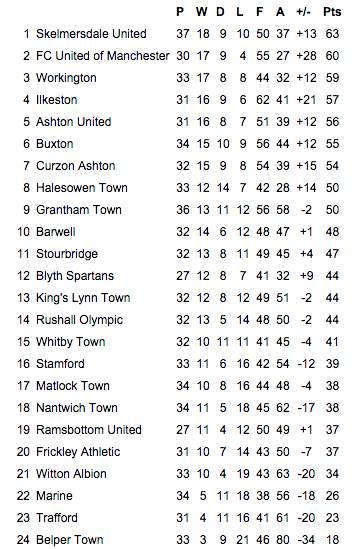 Even Blyth Spartans in twelfth and Ramsbottom United in nineteenth could still catch Skelmersdale! Skem have been top for a long time, but the table is now very unbalanced, and does not give a true reflection of the league really. Postponements and cup runs have left clubs with up to ten games to make up already, which is going to make for a massively busy end to the season. FC United are already facing up to playing every Saturday and midweek between now and the end of the season, with only two free midweek dates left, and they only have seven games to make up. Poor old Ramsgate United and Blyth Spartans already have had to schedule a Thursday game; on March 19th when they face each other. Looking at the table at the moment, it would be easy to argue that Skelmersdale could even miss out on the playoffs considering the amount of points left for other teams to fight for, but the punishing schedules for these clubs will play a part, and Skem should be in the top five come the season’s end. Why, then, do I have FC United as favourites when so many clubs have so many games to play and points to win? Well, firstly, the fixtures. They have sixteen games left to play, and most of them are winnable. They do have to play some of their promotion rivals; Workington AFC and Halesowen Town home and away, Ilkeston FC at home aswell as a trip to Skelmersdale, but the other ten games they would see as potential victories. That, coupled with their fantastic run of form, and they are the clear favourites for me. Since a 1-2 league defeat at Stourbridge on November 22nd, FC have only lost once in sixteen games in all competitions, and that was the single goal FA Trophy elimination at Conference side Torquay. There have also been only two draws in that run, and both of those came in the Trophy aswell. Confidence in the squad must be sky high, and with players like striker Tom Greaves in sensational form, I cannot see past them. Greaves, who scored forty goals last season, had a slow start this term, but is now on twenty two for the season, and bang in form right at the perfect time. The rest of the squad are also performing brilliantly, with the strength in depth needed to see them over the line. In my opinion, the past few years’ failure to go up will stand Marginson and his staff in good stead to make sure they don’t slip up again this time. There is plenty for fans to look forward to. With the delayed stadium at Broadhurst Park finally nearing completion, promotion would be the perfect way to celebrate their new and permanent home. Portuguese giants Benfica are sending a team to play a friendly in May to celebrate the club’s tenth anniversary, meaning that the club and its fans have a very exciting and bright future ahead of them. A look at the club’s upcoming fixtures, it is immediately apparent that they expect to be moving into their new home imminently. Their final three home games, against Stourbridge, Curzon Ashton and Stamford AFC currently have no venue listed. They have been playing their recent home games at Curzon’s ground, so it would be fitting if they could welcome their former landlords to Moston in one of their first games at Broadhurst. Promotion for FC United would be good for the whole of non league football. We all know how and why the club were formed, and to see them reach the second tier of our game in just ten years would be incredible. It would show just what can be achieved by a group of motivated fans, players and staff, and would show once more that fan ownership is a viable option. They really should be playing at Conference North level, and hopefully this is their time to achieve that aim. That said, the Northern Premier League is a horrendously tough league, which they know all too well, and they cannot allow complacency to creep in in the coming weeks. I am sure that will not happen, though, and the Red Rebels will be at Step Two come the start of 2015/16. Posted on February 23, 2015, in Opinion and tagged FC United Of Manchester, Northern Premier League. Bookmark the permalink. Leave a comment.